As of today, I am two days past my due date. Baby seems to be very happy just hanging out. Apparently not ready to meet the world yet! I am getting really excited and maybe a little impatient. I am super excited that this time around we didn't find out the gender and we are doing a home birth! It will be wonderful to be in the comfort of my own home with my family to help out with the kids and dogs. And just to be able to relax and not be in a hospital setting! And my midwife is totally awesome. Which is definitely a bonus. Lately, I have been in a pretty big baking mood. I have definitely done a few days of baking like five things at once. Crazy! I even did some canning. So, a lot of recipes will be coming your way! I have been huge into rhubarb lately. Recipes to come, so stay tuned. I love this time of year when everything is coming alive again! On to these awesome cookies. 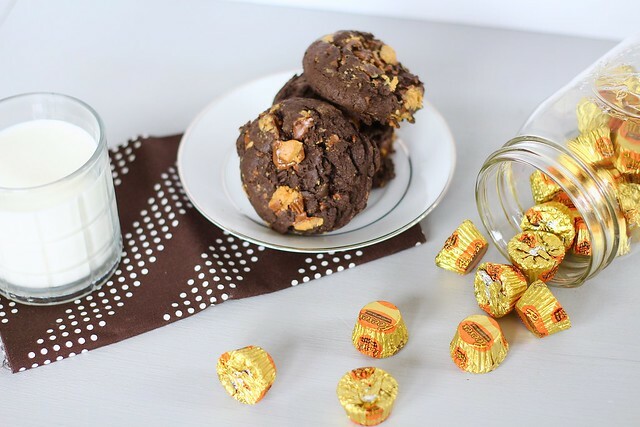 Big, soft chocolate cookies with chunks of peanut butter cups? Yeah, there is no going wrong there. 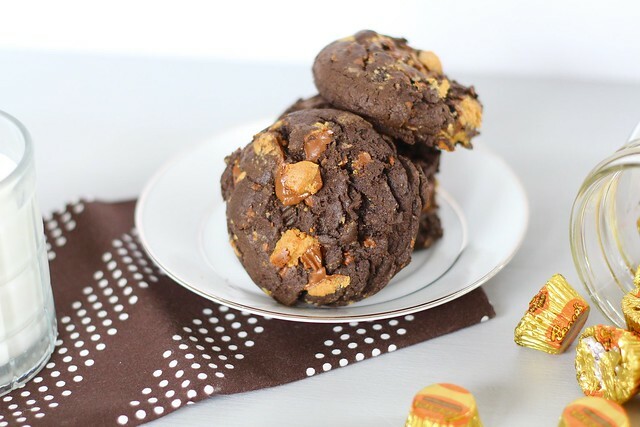 Who doesn't love the chocolate-peanut butter combination? I don't usually like chocolate cookies (I know, I am weird), but even these cookies I can't resist. In a medium bowl, combine the flour, cocoa powder, baking soda, and salt. In the bowl of an electric mixer, combine the butter, peanut butter, granulated sugar and brown sugar. Beat on medium-high speed until light and fluffy, 1-2 minutes. Add in the egg, vanilla extract, and milk. Blend until smooth. With the mixer on low speed, mix in the dry ingredients just until incorporated. 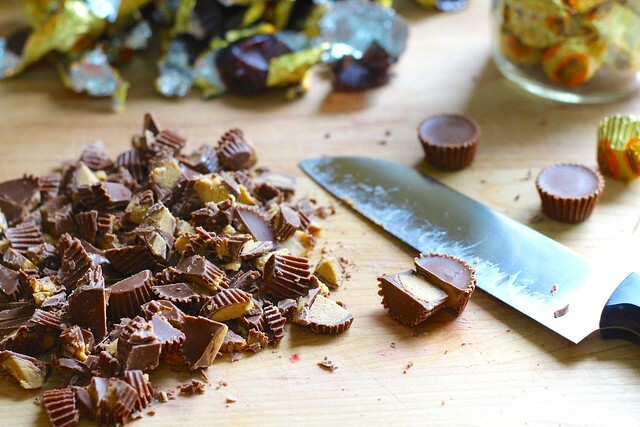 Add in 1 1/2 cups of the chopped peanut butter cups and fold in gently with a spatula. Use a large dough scoop (about 3 tablespoons) to drop rounds of dough onto the baking sheets, spacing 2-3 inches apart. Gently press a few pieces of the reserved peanut butter cups into the top of each of the dough balls. Bake 12-14 minutes, rotating the pans halfway through baking. (The cookies may seem too soft immediately after coming out of the oven but they will set as they cool. You don’t want to overbake them.) Let cool on the baking sheets about 10 minutes, then transfer to a wire rack to cool completely. Store in an airtight container.